STAIRCASE WRITING - Katharine Weber's Writing Journal: The Most Boring Game in the Universe! I love the idea of "CANDY LAND trauma." I suspect that is a common affliction of parents today, this one at least. The not-so-secret CANDYLAND secret: the Dora edition has extra "double square" cards, which make the game go MUCH faster. Hair-pulling moms, take note. Thanks for the backstory on Candyland! I've always thought it was a pretty boring game and now I know why! Candy Land is #2 on the boring list; Chutes and Ladders takes the top spot. And then when you get a bit older and can hold a handful of cards, you can graduate to War. Have you ever played a game called Sweet Tooth 2 on www.Pogo.com? I really like that one. 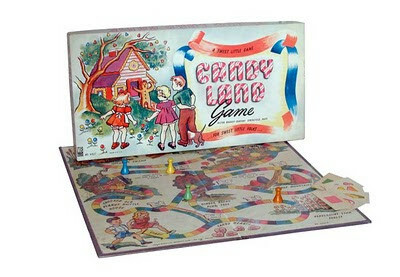 As for games I played as a child, I don't remember having Candy Land. What I do remember is Hi Ho Cherry-O, which I loved. I bet a lot of people can relate!